HARARE, Jan 14 2014 (IPS) - Evelyn Mhasi, a qualified nurse, has not worked in her profession for the last seven years. Hiring in several Zimbabwean government sectors, including nursing, remains frozen despite colleges churning out skilled professionals each year. For many in this southern African nation, the passing of another year only brings with it a deepening dread of the future as many struggle without jobs. According to the Reserve Bank of Zimbabwe, the country’s unemployment rate increased to 10.70 percent in 2011 from 4.20 percent in 2004. However, the United Nations World Food Programme estimates that Zimbabwe’s unemployment rate is about 60 percent. While solid statistics are hard to come by, the vast majority of the country’s workforce is involved in the informal sector. According to the National Statistics Office, Zimbabwe produces about 36,000 higher education graduates annually. Mhasi, 29, closely followed the 2014 national budget announcement by Zimbabwe’s Finance Minister Patrick Chinamasa in December. “I followed the proceedings optimistically, thinking that the government was going to unfreeze some posts for skilled people like me, but to no avail,” Mhasi told IPS. During 2008, when the country’s disputed election results resulted in a power-sharing government, Zimbabwe experienced an economic meltdown, with hyperinflation reaching 231 million percent. The Confederation of Zimbabwe Industries, an organisation that develops and promotes business activities, says that a number of industries have already failed to re-open this year because of financial difficulties. However, it was unable to provide any figures. Independent economist Kingston Nyakurukwa said ordinary people were surviving on shoestring budgets with many unsure about what 2014 held for them. “Remember that last year’s bonuses for civil servants came in batches, which obviously rendered the entire civil service doubtful about what the future held for them in 2014, and even now people fear how they shall fare in the new year,” Nyakurukwa told IPS. “With a 2014 national budget of over four billion dollars, but devoid of adequate revenue collections to meet the target, Zimbabwe heads towards an economic plunge this year,” Nyakurukwa added. For Nyson Chimukwere, a fruit and vegetable vendor from Marondera, a town 80 kilometres east of Zimbabwe’s capital Harare, the year ahead looks gloomy. 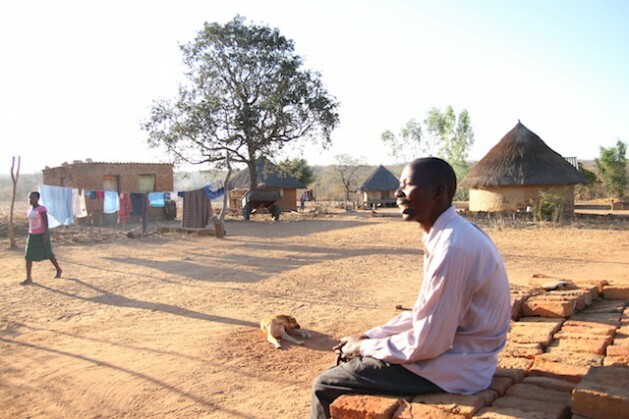 Chimukwere, a father of four, said his earnings have reduced by almost 75 percent. “I’m afraid this year I may end up making nothing from my business. I used to take home about 50 dollars daily from my sales, but now things have taken a nasty turn – I take home 15 dollars or even far less,” said Chimukwere. Rik Davison, who runs the Rik-Davy Glass Company, which employs over 800 people in Zimbabwe’s oldest town Masvingo, also dreads the year ahead. “Lately [business] declined sharply, leaving us going for several days without making any sales, evident of the uncertainties shrouding 2014,” Davison told IPS, adding that because of this he has failed to pay his employees wages on time. Davison said that his fears were worsened by the government’s insistence on implementing the Indigenisation and Economic Empowerment Act of 2007, which forces foreign-owned companies to cede 51 percent of their shares to local black entrepreneurs. Davison, who is white, has yet to cede his shares. But Kudakwashe Bhasikiti, a politiburo member of the ruling Zimbabwe African National Union – Patriotic Front, believes that 2014 is set to be a prosperous year. “We have nothing to fear here with the indigenisation policy in place, we are sure to give wealth to the black people of Zimbabwe,” Bhasikiti, who is the parliamentarian for Zimbabwe’s Mwenezi East constituency, told IPS. Some economists predict that public employees may suffer the brunt of a government payroll shortage. “With revenue collections massively dwindling, this year the Zimbabwean government may fail to sustainably remunerate the already poorly-paid civil servants, after it turned mum on increasing their wages in the budget announcement,” economic expert Agrippa Nhumwe told IPS. A local banker told IPS on the condition of anonymity that hard times were imminent for Zimbabwe’s local banks. “With cash shortages rocking indigenous banks here, hard times are set to roll this year, fuelling civilians’ fear in the face of an unpredictable government, which amid such circumstances may at any time re-introduce the dreaded Zimbabwean dollar dumped in 2008,” the banker told IPS. The Reserve Bank of Zimbabwe, which at the height of the country’s economic meltdown was forced to issue a 100 trillion Zimbabwean dollar note, was forced to stop printing money and adopt a multi-currency regime. For millions of Zimbabweans, it remains to be seen whether or not President Robert Mugabe’s government will succeed in manoeuvring through 2014.